By way of introduction I am the retired bass trombonist of the Boston Symphony Orchestra and retired Professor of Trombone at Arizona State University. I am at work on a book for University of Illinois Press about Homer Rodeheaver, the trombone-playing song leader for Billy Sunday in the first third of the 20th century. A research thread that is currently occupying my interest is the role the Ku Klux Klan played in Billy Sunday meetings. The law prohibiting the teaching of evolution affected textbooks for a while, but its impact was fading within a decade. However, it was not repealed until 1967, when Soviet accomplishments in space were forcing Americans to examine the state of US science education. A similar law, passed in Arkansas through citizens’ initiative, survived until 1968, when in Epperson v Arkansas, the US Supreme Court ruled that the prohibition on teaching evolution was based on religion and therefore unconstitutional. As for the doctrine that creationism itself is religion, not science, and therefore should not be taught in public schools, that was not established in the US courts until McLean v Arkansas,1982 and at Supreme Court level Edwards v Aguillard, 1987, Justice Scalia dissenting. …The collision of Brian and Darrow at Dayton was dramatic, but it was not a drama. Moreover, the issues of their conflict have acquired new dimension and meaning in the 30 years since they clashed at the Rhea County Courthouse. So Inherit the Wind does not pretend to be journalism. It is theatre. It is not 1925. The stage directions set the time as “Not long ago.” It might have been yesterday. It could be tomorrow. “Could be tomorrow”, in 1951, when there had been no monkey trials since 1925? Clearly, the play is not about those events in Dayton, but a comment on the anti-intellectual mob rule of the McCarthy era. Despite this, the play, and the various film versions from 1960 onwards, have shaped public attitudes to the trial and, to my mind, lamentably coarsened debate. Darrow, the best remembered of the defence team, was not the ACLU’s choice, but they could not but follow Scopes in accepting his services, on this, the only occasion on which he offered them without a fee. 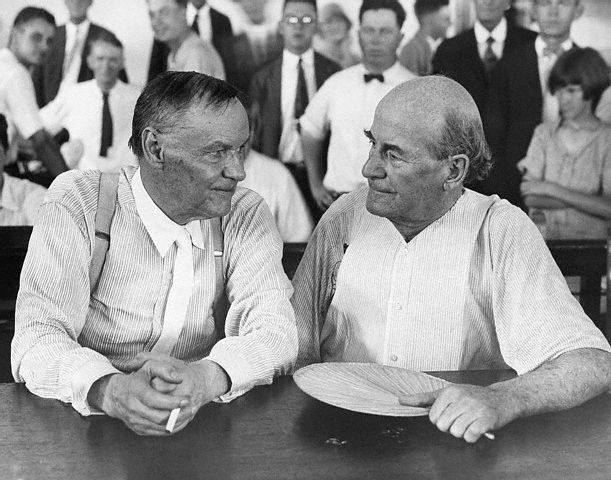 He was an outspoken and abrasive agnostic, of whom the humanist Edwin Mims, Professor of English at Vanderbilt University, Nashville, Tennessee, and theological Modernist, commented, “When Clarence Darrow is put forth as the champion of the forces of enlightenment to fight the battle for scientific knowledge, one feels almost persuaded to become a Fundamentalist.” In his famous cross-examination of Bryan, Darrow comes over as a condescending bully. And yet any sympathy one might feel for Bryan quickly evaporates on reading the speech he had prepared for the court, but was prevented by defence manoeuvres from delivering. Bryan’s position presented defenders of science with a dilemma, to which I would dearly love to find a good resolution: one does not win over opponents by ridiculing their position and humiliating their champion, and yet what else is one to do when faced with ridiculous beliefs presented by a crowd-pleasing and truth-distorting blowhard? This summer sees the 90th anniversary of the trial, widely regarded as an example of reason defeating obscurantism. My friend the historian geologist Michael Roberts argues, and I agree, that this popular view is damaging, as well as mistaken, and that the only long-term beneficiaries of the affair were the Flood Geology pseudoscientists, at the time of the trial itself no more than a fringe group within Young Earth creationism. What follows draws on Michael’s work, and on the trial transcript, the Pulitzer Prize winning account Summer for the Gods by the lawyer and historian Edward J. Larson, and other sources. In the early 1920s, America’s churches were deeply divided between Modernists and Fundamentalists. Bryan, his once-promising political career now over, placed himself at the head of the Fundamentalist faction and its campaign to ban the teaching of evolution. The Governor of Tennessee was in favour of such a ban, but wisely recommended that the law should not specify a penalty. Even without one, it would make the State’s position sufficiently clear to its teachers, whereas if it could result in criminal prosecution, it would invite the controversy of a test case. That of course is exactly what happened. As one might expect, some universities were highly critical of the law. The University of Tennessee itself hesitated to take a position, dependent as it was on state funding for its planned expansion, but Vanderbilt University, a private institution in Nashville, Tennessee, took a clear stand in favour of evolution. There was even a proposal to bar graduates of Tennessee State schools from Columbia University, leading school Superintendent White to suggest that Dayton found its own university, named after Bryan. This happened. The Bryan College Statement of Belief maintains “that the origin of man was by fiat of God in the act of creation as related in the Book of Genesis”, and since 2014 the teaching Faculty have been required to believe in the special creation of a literal historical Adam and Eve. By 1925, when the Tennessee law was passed, the evidence for evolution was reasonably conclusive, but not yet as overwhelming as it is today. Molecular phylogeny, which places common ancestry beyond all reasonable doubt, was still decades in the future. Genetics was in its infancy, but Thomas Hunt Morgan was already working out how Mendelian inheritance, combined with mutation, could drive evolution, and these developments were referred to in Hunter’s Civic Biology, the standard text from which Scopes had taught. The fossil record was meagre by today’s standards, giving some appearance of substance to the creationist claim that Darwinism was based on extrapolation and conjecture, rather than observation. The record of human evolution was particularly scant, depending largely on Neanderthals, Heidelberg Man, and the now discredited Piltdown Man. All of these had cranial capacities not too different from modern humans, so it was still possible to argue that there was a “missing link” between us and what we choose to call lower animals, and the fact that the crude Piltdown forgery was able to survive in the scientific literature for several decades, albeit with heavy question marks, shows how underdeveloped physical anthropology was at that time. If we had to choose a date for when the “missing link” argument lost credibility, I would suggest February 1925, just a few months before the Scopes trial, when the first Australopithecine, the “Taung Child“, was described in the journal Nature. This find attracted major publicity, and the defence planned to use it in evidence. Finally, and of the most enduring interest and importance, we have a conflict between two different concepts of democracy. The prosecution appealed repeatedly to the right of the majority, as the teachers’ paymasters, to specify the content of their teaching. Contrast this with what I might call the principle of liberal democracy, which guarantees freedom of expression, and when it comes to the content of education requires the public to defer to expert opinion. The facts of the case were not in dispute. Scopes had taught from Hunter’s Civic Biology (the State’s own prescribed textbook! ), and in so doing had taught about human evolution, and broken the law. So the case was not really about this, but about the status of the law itself. The defence case would be that Scopes should not be found guilty because what he did should not be called a crime. Nor was the outcome difficult to predict. Judge Raulston was a devout Christian. 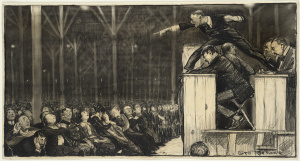 Educated at a Methodist University, he was probably not himself a Fundamentalist, but was an elected official within a Fundamentalist-leaning state. In any case, he may very reasonably have thought that the broader issues should be decided by the higher courts, rather than at district level. So he could be expected to use all his ingenuity to block the defence’s claims. The other prong of the defence case would be to establish that the law was unconstitutional because unreasonable, since it flew in the face of the established scientific fact. So the trial involved both the main issues separating the theological Modernists from the Fundamentalists: evolution, and the proper use, by believers, of Scripture. Regarding the latter, the defence adopted the position later associated with the name of Stephen J Gould and his doctrine of “non-overlapping magisteria“. To interpret the Bible literally was to fail to understand it. Science and religion could not possibly be in conflict, because they were talking about different kinds of thing. Thus the defence hoped to call as witnesses both scientific experts, and leading Modernist theologians. Also, during jury selection, Darrow took care to ask each potential juryman what he thought about evolution. Clearly, many knew nothing about the subject, strengthening the case that they should hear evidence explaining it. For the prosecution, Bryan tried to summon opposing scientific opinion, but could not find anyone of stature willing to testify against evolution. The prosecution therefore changed its tactics, aiming instead to restrict the trial to the simple fact of Scopes’s breach of the law. However, Bryan’s intended closing speech, which defence tactics (see below) prevented him from delivering, was to be a broadside against evolution using all the creationist devices of quote mining, misrepresentation of fact, and claims that evolution was unbiblical, atheistic, and morally corrosive. At the outset, the defence argued that the indictment should be quashed because the law and the indictment based on it were defective, for a mixture of reasons. The State had a constitutional duty to cherish science, and science could not be taught without including evolution. The law was contrary to the State’s own establishment clause, by favouring a particular religion, and thereby violating freedom of conscience. In addition, it was so vague as to be meaningless, since it referred to what was thought in the Bible, but the Bible was open to numerous different interpretations. Hays for the defence argued that the law was intrinsically unreasonable, and therefore exceeded the policing rights of the state, as would a law against teaching that the Earth went round the Sun. “Evolution is as much a scientific fact as the Copernican theory.” The State could determine what subjects should be taught but could not reasonably demand that they be taught falsely. Attorney General Stewart for the prosecution countered that the statute was about the proper use of state funds, and therefore within the State’s proper jurisdiction. The citizenry paid for their schools and therefore had a right to decide what those schools should teach. There was no violation of conscience, since Scopes was free to hold and advocate whatever opinion he chose, but that did not entitle him to propound evolution in opposition to state policy in the State’s own classrooms. The Tennessee State constitution protected religious freedom, and therefore stated that “no preference shall be given by law to any religious establishment or mode of worship.” The law violated this principle, and was a law inhibiting learning. It established a specific religious standard because it gave specific status to the Bible, rather than any other sacred text. Evolution had been taught in Tennessee for years. Bryan “is responsible for this foolish, mischievous and wicked act… Nothing was heard of all that until the fundamentalists got into Tennessee.” As for the Bible, it contained different accounts of creation, making the law unworkable in its vagueness. It was a book of morals, not science. The law was unconstitutional because it violated the great Jeffersonian principle of freedom of conscience, vital to a civil society. The Bible is a book primarily of religion and morals. It is not a book of science. Never was and was never meant to be. They thought the earth was created 4,004 years before the Christian Era. We know better. I doubt if there is a person in Tennessee who does not know better. They told it the best they knew. And while science may change all you may learn of chemistry, geometry and mathematics, there are no doubt certain primitive, elemental instincts in the organs of man that remain the same, he finds out what he can and yearns to know more and supplements his knowledge with hope and faith. That is the province of religion and I haven’t the slightest fault to find with it. Can [the legislature] say to the astronomer, you cannot turn your telescope upon the infinite planets and suns and stars that fill space, lest you find that the earth is not the center of the universe. Can it? It could – except for the work of Thomas Jefferson, which has been woven into every state constitution of the Union, and has stayed there like the flaming sword to protect the rights of man against ignorance and bigotry, and when it is permitted to overwhelm them, then we are taken in a sea of blood and ruin that all the miseries and tortures and carion of the middle ages would be as nothing. The judge was having none of it. In a ruling slightly longer than Darrow’s speech, he gave his opinion that the law was perfectly clear, and legitimate in its scope. The offence consisted in teaching that man was descended from a lower order of animals, and the references to evolution and the Bible merely provided additional context. Later on in the trial, he was to rule on more or less the same grounds that evidence concerning evolution, and about different ways in which the Bible could be interpreted, were beside the point. The defence next quoted the Governor himself as having said that the law was consistent with the existing States textbooks, would not put Tennessee’s teachers in any jeopardy, and would probably never be applied. In response, the judge quite correctly pointed out that under the American doctrine of separation of powers, the Governor as head of the executive branch had no right to impose his own interpretation on the law, this being the role of the judiciary. He also ruled that expert evidence concerning evolution, and about different ways in which the Bible could be interpreted, were irrelevant and inadmissible, but allowed the defence to place such evidence in the trial record for the benefit of the appeals courts. In my next post, I will describe this inadmissible evidence, Darrow’s famous dialogue with Bryan, Bryan’s intended closing speech and why it was not delivered at the trial (although Bryan did deliver two very similar speeches in the days immediately following), how the case was settled, and subsequent legal battles. I will also give my own view on who won, who lost, the extraordinary errors of judgement displayed by both the main protagonists, and the implications for us today. 1] The trial transcript and related documents are freely available as PDF photocopy (readable but not suitable for cut-and-paste, although PDF readers such as Nuance can convert much of it to edit-ready MSWord). In addition to these, and Michael’s account, I have used that given by the constitutional lawyer Douglas Linder (Professor at University of Missouri Kansas City Law School) here. . The fullest account, however, is by the lawyer and historian Edward J. Larson, whose Summer for the Gods earned a Pulitzer Prize. I have also used other sources, such as Ronald Numbers’ authoritative study, The Creationists; Numbers has also posted much of his research on line here, as part of the Counterbalance science in context project. I acknowledge special help from Alastair Arthur, of Glasgow University Library Services. 2] Full text at http://moses.law.umn.edu/darrow/trials.php?tid=7 Here, I have for ease of reading omitted ellipses, and added some half dozen words for continuity. Dayton courthouse courtesy Michael Roberts. Darrow by Mobius, public domain. Taung Child image by Didier Descouens via Wikipedia. This piece appeared earlier in 3 Quarks Daily.